Subscription to "Garden Faces", our monthly newsletter. Monthly meetings : Meet others who love roses in a very friendly atmosphere! Gain valuable information from expert rosarians who have been growing roses for years. Interesting speaker each month. The Birmingham Rose Society meets on the 4th Sunday of each month; refreshments at 3:00 p.m. and meeting at 4:30 p.m..
All meetings are held at the Birmingham Botanical Gardens, except during May, June and July. These meetings will be held at a Birmingham Rose Society member’s home and garden with the locations announced in our monthly newsletter, Garden Faces. 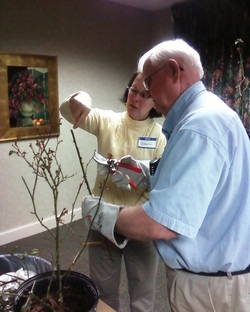 Join us to gain valuable insights on growing roses! Our friendly group will be glad to share their knowledge with you! You don't have to be a member to attend a meeting! Join Us! Your support of the Birmingham Rose Society enables us to continue to educate the public about our National Floral Emblem; The Rose. It also helps us to produce a "best in class" rose show each year that draws hundreds of people from all over the south to see the roses and the learn how to best care for them. We invite corporate involvement from companies who desire to join us in increasing the public's knowledge of the rose.